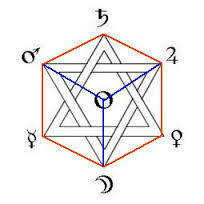 This cube represents six points with man in the middle. Ancient Greeks taught that souls come to the earth from, and return to the Milky Way via seven planetary spheres – those being Saturn, Jupiter, Mars the Sun, Venus, Mercury and the Moon. In the image above we see the stars and signs of the zodiac at the top, Saturn through Mercury down the back of the chair, the Moon in the sky and Earth in his hands. The logic of this order doesn’t appear to make sense until you look at an image which shows the spheres mapped onto the seven points (including the center) of a hexagram. Note how the sun (symbolized by a point in a circle) is at the center of this diagram and how the planets are divided with the outer ones being ‘above’ the sun. In Revelation Ch. 1 we read- “I saw seven golden candlesticks; and in the midst of the seven candle sticks one like unto the Son of man… and in his right hand seven stars: and his countenance was as the sun shineth in his strength.” The menorah, seven candlesticks used for the Hebrew festival of lights, appears to represent the seven ancient planetary spheres, as do the seven stars in the Revelation. The days of creation and days of the week are related as well. Remember that I said that they ‘taught’ that, not that they believed it; by which I mean that I believe that the legend of the soul’s supposed journey, along with the image above, was really an ancient astronomy learning tool. Rememeber M-V-E-M- J – S-U-N-P ? Today we are taught that atoms act just like the solar system with the particles orbiting just as planets orbit the sun, while four hundred years ago people were still being burned for declaring that the sun is the center of the system, in all likelihood by people who knew that they were telling the truth. The Greeks appear to have encoded some basic astronomical facts into an image and a legend that have survived scrutiny. Two important aspects of the ancient system of knowledge appear to have been astronomy and myth making and symbolic skills. In the middle frame above we see depicted the ancient order of descent from Saturn to Jupiter, then Mars, the Sun etc; note how it images to us a lightning strike. In Ezekiel (1:14) we read “And the living creatures ran and returned as the appearance of a flash of lightning“. That is to say, souls come from and return to the Milky Way via seven spheres in a path (on the image) that looks like a lightning strike. Shooting stars and stones that fall (are exiled) to the earth are also poetically compared to the descent phase of the soul’s legendary journey. Meteorological and astronomical metaphors are used for the so called ‘fall’ from heaven to the earth. In Rev 4:5 we see, “And out of the throne proceeded lightnings and thunderings and there were seven lamps of fire burning before the throne which are the seven spirits of God.” Since the soul’s journey takes place via seven spheres, the creation of the world is accomplished in seven days (each day named for a sphere).